Ah, the old phrase: 'Til death do we part. I'm afraid this clause no longer applies, it seems that last time we came around with a notice of Blood Tax Payments are Due you did not pay. I'm afraid that means Teysa Karlov will have to alter your contract. Instead of simply paying money or selling the souls of your ancestors, you must now serve the Orzhov in the Afterlife. Unless the Tithe Taker is payed, I'm afraid that this will be the fate of many more souls. If you are indebted to the Orzhov you may also make payments at the Godless Shrine to Elenda, the Dusk Rose or the Hallowed Spiritkeeper . I would not suggest trying to bargain or avoid your debts, all who have done so have met a gruesome end at the hand of a Pitiless Pontiff . If the Syndicate is not paid in a timely manner I'm afraid that Teysa Karlov will have to issue a Merciless Eviction and you will spend the rest of your days at the Debtors' Knell . 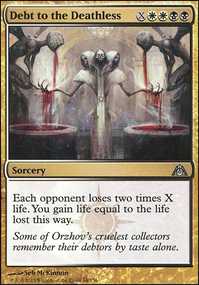 That being said, I would suggest you lay in full unless you want to spend the Afterlife in service of the Orzhov Syndicate. Basically this deck tries to take advantage of die/Exit the Battlefield triggers, especially the ones centered around creatures. 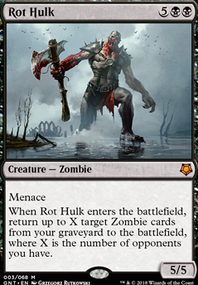 Cards such as Hangarback Walker , Elenda, the Dusk Rose , and the new afterlife mechanic are good examples of this. We also just want to generate value through creatures dying with cards like Blood Artist and Dictate of Erebos . To take advantage of all these triggers we try to have sac outlets in place to get rid of our creatures at will. Ways to bring those creatures back are also important, it allows us to get more value by just doing it all over again. 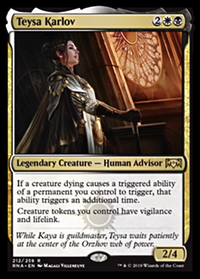 Once the tokens are out we want to abuse the lifelink and vigilance given by Teysa Karlov to gain tons of life, then take advantage of creatures dying by chump blocking where needed. We have some good options when it comes to creating our tokens in this deck. Anointed Procession : Token doubling? Yes please! This also goes nicely with Teysa Karlov . If a creature dying creates tokens you double the first trigger of tokens, then it doubles again! This means that you can get about 4x more tokens than you would otherwise. Bitterblossom , Crested Sunmare , and Grave Titan : These card just allow us to generate tokens consistently. Alright, we have all these tokens created. The question is: What can we do with them? Ashnod's Altar and Priest of the Forgotten Gods : These help generate mana so we can cast more spells. Ayli, Eternal Pilgrim and Plaguecrafter : These cards can act as removal, especially for those pesky indestructible creatures. Pitiless Pontiff : Just an amazing chump blocker when need be. Viscera Seer and Yahenni, Undying Partisan : These just give us value. Razaketh, the Foulblooded : If there is a card that is just crucial to the current situation then he can go grab it for us. Great, now we have a problem. In our quest for value we sacrificed our creatures that gave us value, we need them back. Without recursion this deck can run dry, which would be very bad. Besides, who wouldn't want to get tons of tokens off of Elenda, the Dusk Rose , twice! Repeated Recursion: Debtors' Knell , Lifeline , Sheoldred, Whispering One , Sun Titan , Demon of Dark Schemes , and Ravos, Soultender all give us this benefit. Wait, I didn't want everything gone! : Well, good thing Faith's Reward is here to return everything that we lost. Liliana, Heretical Healer Flip: Once this flips and we are able to get her Emblem out this will be powerful recursion. This will give us the power to sac things multiple times, allowing us to get tons of value. Now, what is the point of having this cool stuff going on if we can't keep it relatively safe? Lightning Greaves : With this we can give any creature that we want to stay safe a way to avoid targeted removal. Leyline of Sanctity : This can protect against targeted graveyard hate, which is extremely deadly to this kind of deck. Teferi's Protection : This can help us avoid boardwipes or mass exile that we want to avoid. This deck can play well around decks that run a lot of removal. Our creatures want to die, making removal very inefficient for out opponents. More strengths coming as I playtest. Mass Exile: When our creatures get exiled they don't trigger our effects, and since they are exiled we can't get them back! While yes, we can try and sacrifice our creatures so that we can get them back later, this may not always be possible. Times that we will be vulnerable will be: If they take out the outlet before hand, or we are tapped out and the outlets cost mana to use (which shouldn't happen too often if you err on the side of caution). Combo: We can't stop a combo by countering spells, instead we have to hope that is is creature based so that we can kill it. Child of Alara decks: Facing these decks is really frustrating with this deck is frustrating. We aren't able to build any sort of board state, especially since Child of Alara come out and dies about every other turn. If you see this it's time to make allies and pray that you can somehow deal with it. More weaknesses coming as I playtest. Cards I am thinking about. I basically just have cards that I think would be good in the deck, but want to test the deck to see what doesn't work before I put them in for. I hope you like the deck! Comments, suggestions, and upvotes are encouraged. If you want a more budget friendly/casual version of a Teysa Karlov deck then feel free to check out My Personal Teysa Karlov EDH. As of January 31, 2019 this deck is the #1 Teysa Karlov deck on TappedOut! Also, special thanks to scotchtapedsleeves for doing the coding for the deckpage! Holy crap, this deck (as of January 31, 2019) is the #1 Teysa Karlov deck on TappedOut! This is a big achievement for me, as this is the first deck to do so. Let's hope it's not the last! As you can probably see I have a new look to the deck. A special thanks goes to scotchtapedsleeves for doing such an amazing job on the coding to make it happen!